If you fancy winter flying fun in the sun, or want to accelerate your understanding of the G meter, take a look in the December-January issue of S&G. You’ll also find the annual round-up of competition results and ratings. As our front cover shows, when it’s winter in the UK, it’s summer in South Africa. This was the appeal for Alan Munro, a latecomer to the sport, who was struggling to find the time (and weather) to progress his gliding. Soaring alongside Lappet-Faced Vultures in Bloemfontein, Alan achieved 40 hours in two weeks and came away with a Diamond goal. We take a look at some of 2009’s highlights, including Jochen Ewald’s report and pictures from the VGC Annual Rally in Germany;competition flying at all levels – from a regionals debut to competing in the Women’s Worlds, not forgetting Competition Enterprise for those who prefer a more relaxed approach to traditional competition flying; plus the annual round-up of competition results and ratings. Steve Longland helps us accelerate our understanding of the G meter – particularly helpful if you are planning aerobatic flights, when it is beneficial to be aware that, although indicated G may be within acceptable limits during a rolling, high-G, high-speed pullout (not recommended! ), parts of the structure could be teetering on the edge of theirs. Steve also looks at the Turn and Slip, suggesting that the best way to find out about the T/S is to use one – out of cloud first! In November, it was great to see so many dedicated and capable volunteers at the BGA Chairmen’s Conference/Treasurers’ Forum. Delegates were met with some stark safety messages, but there were also many positive stories ranging from initiatives to grow participation in the sport to how to further reduce our carbon footprint and cut fuel bills by converting a standard gliding toilet block into a shiny new ‘green’ one. 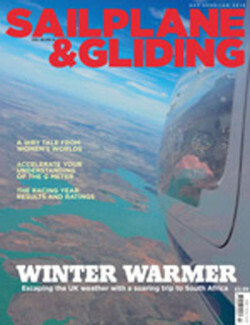 Also in this issue: BGA Chairman Patrick Naegeli acknowledges Chris Wills’ contribution to gliding and asks whether we can all put the same energy and drive into ensuring safe gliding. BGA Development Officer Alison Randle talks about the Junior strategysowing the seeds for future pilots. S&G editor Susan Newby sees Peugeot’s new 3008 launch a Junior at Snitterfield and talks to Andy Sutton – Peugeot’s PR director and also an instructor at Stratford on Avon – about why the club was the perfect venue for a press launch. Andy Perkins reviews scholarship options. BGA Chief Executive and CAMO Accountable Manager Pete Stratten looks at the changes to the BGA Airworthiness Organisation now necessary under its Part M approvals. Liz Sparrow and Tim Milner report on the North and South Comp-ette. Kerry Mertz looks at the gliding career of Nene Valley’s Roger Morrisroe, celebrating a staggering50 years as an instructor. Mike Jefferyes reports on this year’s Inter-League finals. Season’s greetings and safe landings. Are you motivated, but strapped for cash? Then why not consider a scholarship. Andy Perkins reviews the options.